Home Was Jagath Chamila that good? Was Jagath Chamila that good? Jagath Chamila was internationally acclaimed for his unique portrayal as ‘Sami’ in ‘Samige Kathava’, a film by Priyankara Vittanachchi. The film is based on the award-winning novel, ‘Sam’s Story’ authored by Captain Elmo Jayawardene who created the protagonist out of a real-life character. Captain Jayawardene explains how he feels about Chamila’s performance. The New York Film Festival is over; the best actor award is securely placed in a little hamlet in Moratuwa and everyone has now come to know Jagath Chamila. Great feat and nothing should take away the luminosity he enjoys today as he richly deserves the accolade for the role he played as Sam in Sameege Kathawa. My lines are to praise him and state my humble or ‘not so humble’ opinion on an event that started on the banks of Bolgoda and crept its way to the silver screen in the Big Apple. I saw the movie more than six times, from the first print that Director/Producer Priyankara Vithanachchi made. Let the movie speak for itself. A book and a movie are not easy to compare. Authors have space, and for them it is only a matter of spinning a story by minting words and expressions to arouse the interest of a reader. They have a wide canvas to beautify with colourful descriptions and well-constructed lines to fill their books. Film makers have a much harder task. They struggle in turbid tangles and battle multiple fronts. First with budgets, (do not forget this is Priyankara and not Spielberg.) They have to use so much creativity and do a balancing act in order to come out with the best possible combination to create a winning movie. There too the probabilities linger, to slip on the last step when victory is within reach. Priyankara made Sameege Kathawa with varying winds that blew mostly from negative directions. This was his first real film. How good is it? That you will see and decide for yourself, yes, it is in the eyes of the beholder. I only hope that Sameege Kathawa will hit the cinema halls fast as it is a people’s movie and they now have a national hero to watch. Jagath won the award and he is a celebrity, a real one amidst the ‘card board Sandos’ we are forced to worship. I am waiting to see how the cookie crumbles. 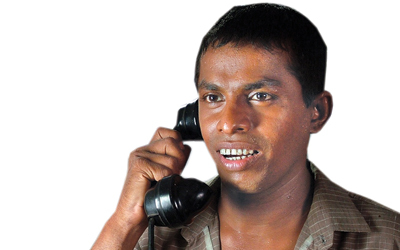 Will the masses get a chance to see Jagath playing Sammy, ASAP? Let me now change the navigation and head towards this fabulous young man who has ‘Done It.’ If anyone knows the character of Sam that carried the movie, I think it would be me, simply because I created Sam and wrote the book. Every time I saw the movie, I was amazed by many aspects of the screen version. There were some scenes I felt could have been done better, but the totality thrilled me immensely. Producer Priyankara gets all the credit and without any hesitation I say, it was Jagath as Sam who carried the show. He was simply fantastic. What I put into Sam, he acted and came out with the exact replica of what I created. He did not over act and he did not go below the bench mark. He really was Sam. Yes Dustin Hoffman played Rain Man and Tom Hanks was Forrest Gump. Both Hanks and Hoffman came from the ‘hit-parade’ of Hollywood with great past reputations and had head starts in any acting evaluation. Jagath was from Janasiri Mawatha, Moratumulla, a far cry from the boulevards of California and yet was good enough for New York. Jagath was a total stranger to the judges. They had not sat at cutlery-glittering candlelit dinners with the actor from Moratuwa. Jagath was just an ‘also ran’ for everybody, a mere ‘ping pong’ player at Wimbledon. That was the playing field, clearly stacked against smaller than small people like us amidst the champagne campaigners. In New York there was only a small supporting team, Jagath, movie maker Priyankara, Wimal Deshapriya the associate producer and Athula Sulthanagoda the costume designer who had crossed the Atlantic to attend the great festival. They were almost insignificant pilgrims on a glittering stage, crab-crawling amidst the sultans of the international celluloid world. They did have some NY Sri Lankans for side support, ‘Boston News’ couple Chitral and Vyomi and maybe a few more I do not know. “And the winner for the best actor award goes to Jagath Chamila” so said the man with the mike, shooting the Moratumulla Cambrian to instant celebrity status and giving Sri Lanka and all Sri Lankans a genuine reason to celebrate. I have no words to describe what I felt when I saw Jagath standing up and squeezing past Priyankara to make his walk of fame. That was a sight for me, to last a life time. Was Jagath that good? Yes he was. There are some scenes in the movie that totally captivated me. I saw Sam in the book and Jagath in the movie merged together in the portrayal of a difficult role acted to a mercurial best. ‘Waiting for the postman, sitting with his mother and watching her weep when they buried his brother Jaya, the hospital scene and the telephone scene,’ they were classic. The walk, the grin, the uncertainties of Sam’s little mind grappling with the world, they were streaks of brilliance that flashed as the movie rolled on. Sopi Akka’s amorous advances and Sam’s reactions were saucily class. No wonder New York decided he was the best, of that there was no question. Jagath certainly did not win by sending Christmas Cards to the Judges or carrying Dilmah Tea packets as gifts for the movie Mandarins of the festival. Where does it all go now? Yes Jagath Chamila is a celebrity and he richly deserves to be one. Of course as the saying goes, victory has a hundred fathers. There will be those now who will parachute from the sky to steal the limelight and borrow credit. That is to be expected. But there are the true stakeholders too; Priyankara leads the victory parade and his entire filming crew richly deserve total credit for what they created. And the supporting cast, Nilmini Buweneka gives a stunning performance as Sam’s mother. There was Kade Mudalali and the estate kankani (I do not know the names) they were great too and of course the veterans Sanath Gunatilaka and Manik Kurukulasooriya added the extra flavour. The cast deserves their share of the victory and I for one applaud them all. One more name needs to be mentioned. I met Jagath a month ago, before his NY skyrocket to fame. This was a pure Moratuwa scene, I had gone to run at the Lunawa Lagoon track and Jagath and his wife Madhu were there teaching their children to ride bicycles. We spoke of this and that and in conversation I asked where he learnt to act. “In school Captain, we had a drama master, Tissa Gunawardena; he was the one who taught me to act. I do not know where you are Mr. Gunawardena but you sure laid the foundation and gave Jagath firm ground to leap to the world and shout “I won this award for my country.” And for the record Mr Drama Sir, you are no parachutist, but a Grand Master who created a Great Actor. Congratulations! Let us all hope that the powers that control the screening of movies in Sri Lanka would take into consideration that “Sameege Kathawa” is special. Let Priyankara Vithanachchi be able to show his movie before time corrodes the excitement. People need to see how Jagath became the best actor in New York. The country owes him that, simply because his was a class act.